While this place was covered in the openings thread, my dinner at Daisies this weekend was good enough to suggest the need for a separate thread. My wife and I arrived there at 8:30 after a warm-up at Websters Wine Bar down the street. The place was packed, and loud, but in an energetic way. Carrot rillettes were essentially diced cooked carrots with a dose of duck fat. They were ok, but suffered following a snack of real rillettes at Websters. What did rock were the pickled carrots on the side. These were sliced thin and cooked to the texture of noodles with a vinegar punch. I would love to recreate these at home. Raw butternut squash salad with brown butter was our favorite dish. The waiter, who was very engaging, noted that it was a specific heirloom breed of squash (which she also helped us find online for the garden next year) that made the dish work texture-wise. The crunchy and sweet squash held up to rich brown butter. Very interesting idea. For mains, my wife enjoyed the very beet-y beet agnolotti, which I passed on trying as I am not particularly fond of the vegetable. I had the homemade tajarin, which was a lovely rich pasta accented with chicken cracklings turned to breadcrumbs. It was very nice, if a bit rich. The wine list is also unusual, as it is all US-based wine but not the usual suspects: Ohio, New York, Illinois and Michigan all sat beside California, Oregon and Washington. Styles and grapes varied as well: who pours a skin-contact trousseau gris by the glass? We ended up with a red blend from Cruse in California which was very nice and interesting to try since we usually drink more European wines. All, in a very nice spot and one I plan to revisit soon. I had been mentally boycotting this pasta-focused, plant-oriented restaurant because it opened in the Analogue space - and I loved Analogue. However, I had heard some interesting things about the pastas here and was looking for a new place to try in the neighborhood. In short, the pastas we tried were excellent. 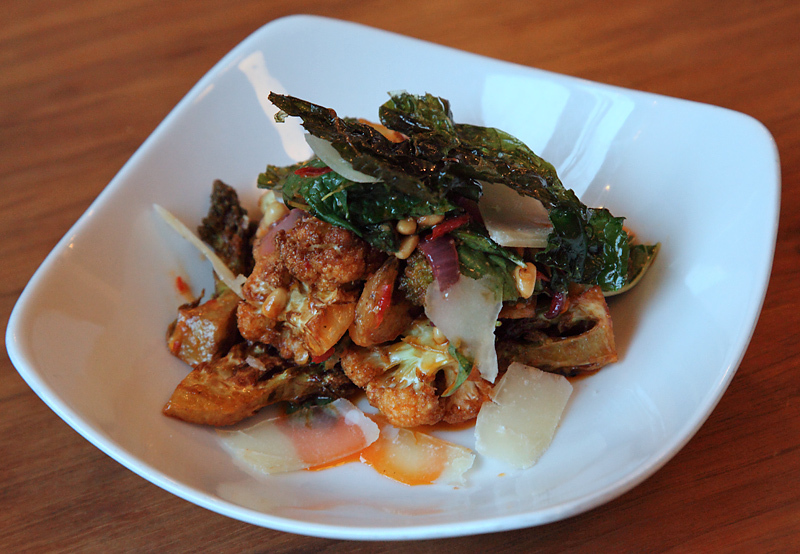 As was a grilled cauliflower dish with calabrian chiles. A carrot "rillettes" dish (quotes = mine) was fine, but the seeded flatbread it was served with was fantastic and was even better after I requested butter with it. 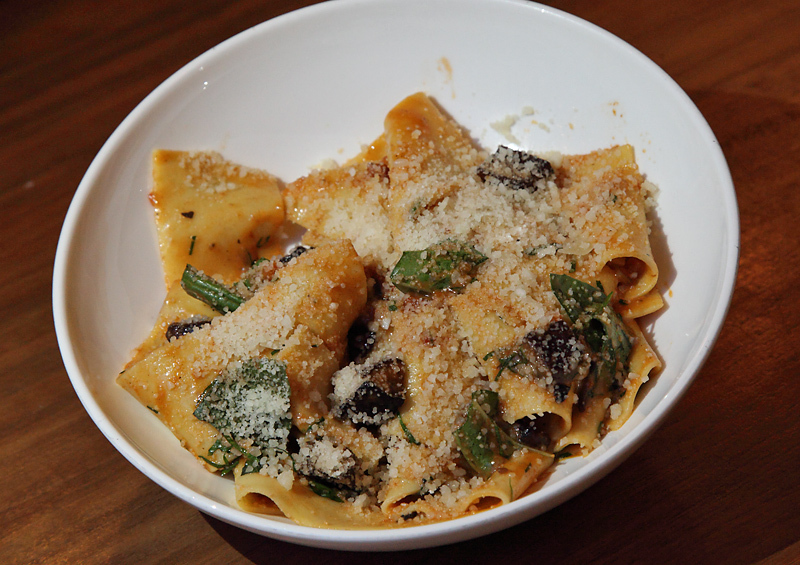 Their menu changes so frequently that I cannot recall all the details of the pastas we tried. 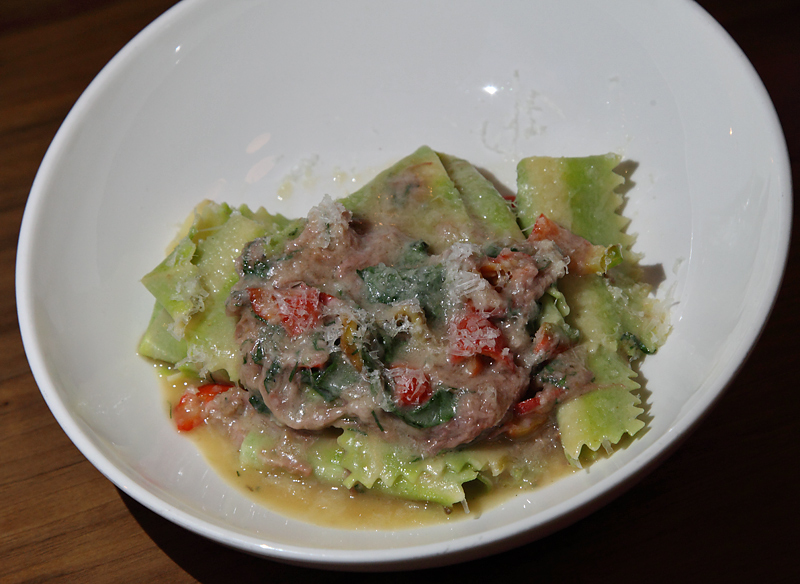 I think one was a fava bean leaf pesto with agnolotti. 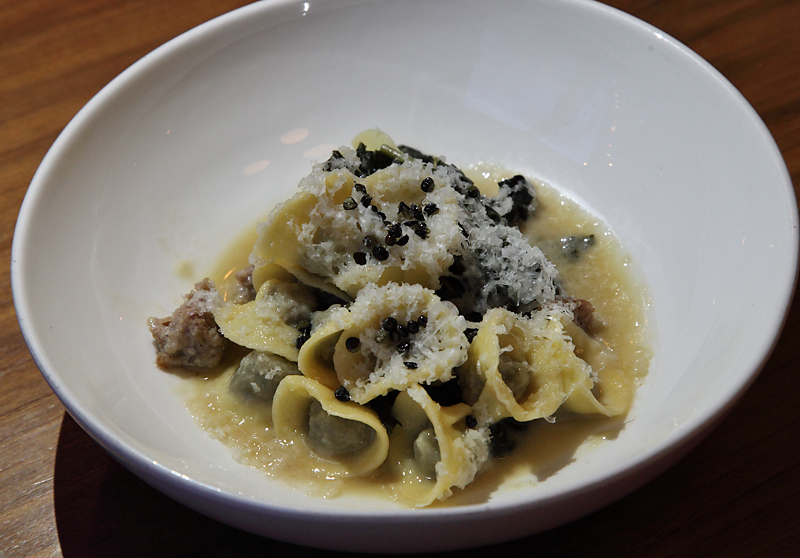 The pesto had just a hint of favas and the (I think) cheese-filled agnolotti were a good pair. The other pasta was a shape/variety that I don't see as often and it was cooked perfectly al dente and dressed just so. Pick a couple of these and it could be a light, satisfying dinner. They are having fun and cooking starches very well. I will return. I've eaten at Daisies a few times and I admit that at first I felt the same antipathy about it not being Analogue that gg describes above but the quality of their fare -- excellent from the outset -- has steadily improved since the beginning, and has won me over in a major way. This kitchen seems to be hitting their stride. Last week our group had a phenomenal dinner there. We sampled virtually everything on the menu and came away immensely satisfied. With the possible exception of Giant, I don't know of any place in town putting out better pasta than Daisies. The only item we had that I didn't love was a pork dish, possibly a pork porterhouse (website currently lists a roast loin, but I'm not sure that's what we had). It was fine, but the sauce was a bit sweet for my taste and the beans that accompanied it seemed just a bit under-cooked. We sat in the back room, where it was pretty loud. In spite of that, service was stellar in every way. We opted for cocktails but given what we ate, a bottle of wine would have almost certainly been a better choice. Oh well, that'll be something to look forward to on our next visit. I've been twice and would like to second (or fourth, as the case may be) the previous praise. The first time, I had some sort of butternut squash salad (perhaps the one that tazerowe mentioned) which was light and perfectly balanced -- everything it should have been. I don't quite remember the pastas we had, but I remember fond feelings about them. The second time, we had the aforementioned cauliflower dish, to which I would like to add my unqualified praise. Again, light and perfectly balanced. I also had the gnocchi with fava pesto, which was perhaps the best specimen of that pasta I've ever had. 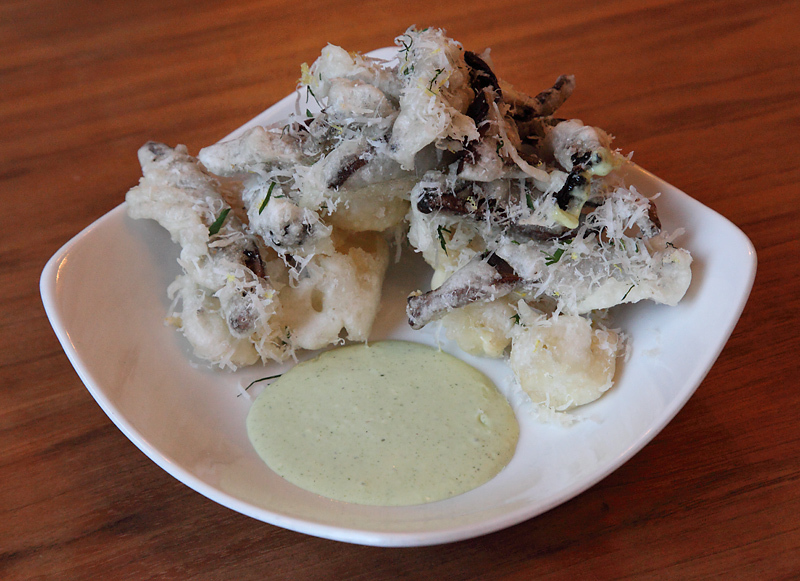 They were cloud-like -- exquisitely fluffy while retaining their structural integrity, complemented perfectly by the pesto. I'm glad someone found an existing thread and moved my post here. I tried searching for something and had not found it. I think Ronnie and I must have been there around similar times because the menu he posted looks very familiar. I think our second pasta was the papardalle he listed. It was excellent and really showed off the cooking to al dente chops of the kitchen. Regarding wine, I wasn't tickled by any of the cocktails but saw a Cab Franc from Ohio on the list. I haven't seen much Ohio wine on lists so I asked the waiter about it and he enthusiastically told me about the 100 year old wine it came from and a bit of history of wine in the Ohio river valley. I ordered it out of curiosity and it was fine but I was impressed by the wine knowledge and verve of the waitstaff - which it seems by tazerowe was also praising in his initial post I didn't see (at least in the construction of a US-focused list). Another point in Daisies' favor. ronnie_suburban wrote: Here's are the highlight dishes from our meal. Haha, thanks. It just wasn't feasible this time . . . but another 'for next time' item. If not for the price, I would be in there every week. Had another really nice dinner over at Daisies earlier this week. The menu has changed in ways that are mindful of the season but at its core, it remains focused on expertly executed pasta . . .
Two of my favorite vegetables in a really nice dish, and yet the highlight might have been the 'business' that accompanied the veggies. The combination of chiles, vinegar, pine nuts and onions was irresistible. A new plating of a dish that, I believe, has been on the menu since Day 1. It's still wonderful, especially if you enjoy tarragon, which is very up-front and center in the sauce. I love how light and crispy the fried items are. So incredibly satisfying, this is the epitome of comfort food. A great combination of flavors, aromas and textures. In my hands, this dish was not very photogenic but it was beautiful and delicious. The tender and toothsome bi-colored noodles were perfect. The rich lamb and mildly spicy peppers were delectable. Our server was friendly, accommodating, intuitive and efficient. I had a glass of Michigan riesling that didn't wow me -- and that I didn't finish -- but in the end, that didn't matter very much. My wife enjoyed her negroni, though. i urge all you daisies lovers to check out the holiday special menu (which i believe is up for 1 more week...) as it's quite a departure from the dinner menu and totally unexpected. (no hint of it on their website.) we were there sunday and luckily all 3 of us were excited by it, as it's only available for the whole table. (and well priced at $50 + optional $30 for wine). shockingly, since i'm a somewhat picky eater, there was nothing on the 6 course-plus-dessert menu that didn't look, and prove to be, terrific. then we were served the following: raw shredded brussel sprouts in browned butter; meltingly tender braised leeks with some cheesy goodness; (the menu did not go into great detail), duck filled tortellini in brodo (strangely, we were not given pasta bowls or spoons, just flat plates to eat this); potato gnocchi/pheasant sugo (not a lot of meat to be seen, but wonderful nonetheless); rich sturgeon simply served in a butter sauce; and then zampone, something i wasn't familiar with, a traditional christmas dish from emilia. daisies seems to have combined 2 christmas traditions-cotechino sausage and zampone(pig skin stuffed with ground pork) into a single hockey puck shaped and breaded treat. the raspberry jam served on top really made the dish sing. for dessert we were served a coffee mug filled with chocolate budino(pudding) made special with lots of not-quite-burnt tasting chocolate cookie crumbs. and a nice touch was the comped plate of their oat bars with a candle, since one of us was celebrating a birthday... the service was impeccable- all in all a memorable dinner.